Can theatre in schools tackle county lines drug phenomenon? 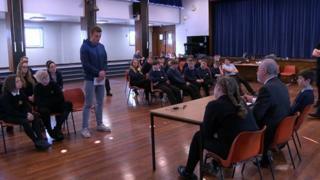 Children are being taught how to recognise the dangers of county lines drug networks, after "significant problems" in north Wales. There is "strong evidence" of county lines in the area, according to the head of a drug and alcohol charity. The gangs operate using vulnerable youngsters to sell drugs locally, on behalf of senior dealers miles away. The Chief Constable for North Wales Police said previously it was a "priority" for the force. Clive Wolfendale, chief executive of Welsh drug and alcohol charity Cais, said it was important young people know the risks and dangers associated with predatory criminals who deal illegal drugs. "Too many young people are falling prey to ruthless gangs, who are trading misery," he said. "North Wales is not immune from this problem and, in fact, there is strong evidence of significant problems in some areas." Why has county lines hit Wales so hard? Mr Wolfendale, who previously served as deputy chief constable for North Wales Police, added that, as well as education work, there needed to be renewed and determined policing efforts too. Emyr John, from Theatr Clwyd which is putting on the play, also said county lines was "a growing issue" in north Wales, with gangs coming into the area from Liverpool, Birmingham and Manchester. The play called 'Justice in a day - County Lines' shows how county lines gangs operate and the consequences of the justice system. In the performance, 16-year-old Connor is befriended and paid well for delivering a few packages by a mysterious adult Jonah. Despite the drugs not coming directly from Connor, he is the one left exploited and serving an 18-month prison sentence for intent to supply Class A drugs. Year eight pupil Chelsea, who watched the play, said: "You realise how easy it is to be manipulated into things like money and how to identify when someone is being manipulated." David Evans, from North Wales Police and Community Trust (PACT), said: "County lines and knife crime are a continuing scourge on our society and it is vital that we educate our young people to help keep them safe from harm." The theatre company, which runs the project with North Wales PACT and the Scottish Power Foundation, will visit 40 secondary schools across Flintshire, Conwy, Denbighshire, Gwynedd, Anglesey and Wrexham.